Open all year round and close to the sea, the Sans Souci Hotel is a family-run three-star hotel recently renovated. It is ideal for families and has a garden, a children's playground area, fenced parking and free WI-FI throughout the entire hotel. Accept pets. 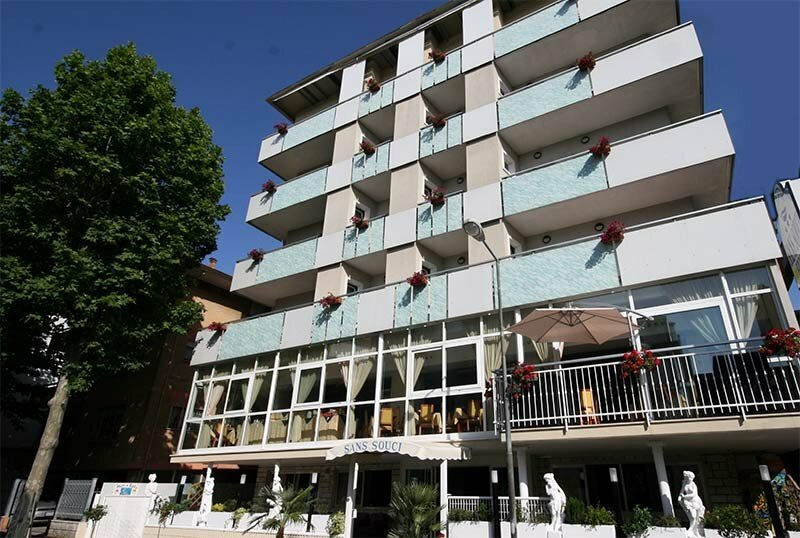 The hotel is located near the beach of Marebello, a suburb of Rimini sud, in a side street of the Viale Regina Margherita waterfront. The area is well connected to the center of Rimini and Riccione by the number 11 bus. Some rooms have a sea view, all have been recently renovated and have a balcony, bathroom with hydro-shower box, hairdryer, satellite TV, telephone and safe. On request: minibar, rooms with sea view and breakfast in the room. Air conditioning with charge. FAMILIES: multi-bed solutions are available. Garden, children's area with games, billiards, American bar, satellite TV room, 24-hour reception, reading room with newspapers, panoramic restaurant, beach towels on request. Theme nights are organized. AIR CONDITIONING: available in all rooms, free in the room in All Inclusive formula. AGREEMENTS: beach, amusement parks, gymnasium, discos, swimming pool, law enforcement agencies (Guardia di Finanza) spas and waterslides. On request: shuttle service and organized excursions. LUNCH AND DINNER: the menus to choose from are 3 and include meat and fresh fish dishes for lunch and dinner accompanied by a large vegetable buffet. The pastry shop is inside and all the baked goods, including bread, pizza and breadsticks are homemade, as is the pasta and piadina from Romagna, which is prepared on the spot every evening and cooked in front of guests. CHANGES: the menu includes vegetarian dishes and, on request, gluten-free and à la carte menus are available. In the hotel: outdoor playground area, strollers, baby / mini club, summer entertainment. On request: baby sitter and pediatric counseling. At meals: table seats, baby menus, baby food and bottle warmers. The hotel has an agreement with the beach n. 102, an establishment equipped with beach umbrella and sunbeds rental, children's playground area, gym, relaxation area with magazines, beach volleyball court, toilette, nursery and entertainment. The list prices are per person per day per week stay. If you book a minimum stay of 6 nights by April 30, in a double room from June to September, you will immediately receive a discount starting from 5% on the list price. The discount must however be agreed with the Management as it may vary depending on the period and availability. Contact us now and you will be guaranteed the best rate. Book in advance your holiday week on the occasion of the Pink Night, the New Year of the Riviera! Come and discover our Hotel + Theme Park offer valid for the entire 2019 summer season! The Hotel Sans Sousi, a few steps from Fiabilandia, has prepared an offer not to be missed! Hotel + Park, in All Inclusive Formula for a minimum of 6 nights in a double room, starting from € 54.00 per person. for children 50% discount on the price of the Hotel and of the Fiabilandia Park. Possibility also of Formula in B&B + Park, starting from € 30.00 per person. Hotel plus free admission to a park of your choice: Mirabilandia, Italy in Miniature, Oltremare, Cattolica Aquarium and Fiabilandia a few steps from the hotel valid for 2 consecutive days! Packed replacement meal on request. - from 4 to 13 years -50%. Family plans available, contact us! Spend the bridges of April 25th and May 1st in Rimini at the Sans Souci Hotel in B & B. - Theme parks to be chosen in advance presale with entry without row valid 2 consecutive days! Family plans: 4 pay 3! - Elegant rooms of a superior category. Republic Day in the hotel with all the comforts.